The cashier at the supermarket handed me a small tube of a type of cream. “Oh, another freebie,” I thought. Often when you buy certain products a sample of something or other is on offer for free. This time the bottle of shampoo I was buying was offering a free sample of this cream. I had a closer look. It was a tube of ‘Fair and Lovely’ fairness cream. I handed it back to the cashier, who it took it back with a smile and said: “Oh, you don’t need this, Madam!” I had to laugh because in Europe, my olive complexion is considered dark, but here I get comments like: “That colour you’re wearing looks so nice on your fair skin!” That goes to show that everything is relative, even skin colour. It’s hard to ignore the importance put on skin colour in India. I hear all kinds of comments around me like: “You’re looking dark, are you sick?”, which I find funny because in the West, paleness is considered to be a sign of ill health! “Oh, you got so tanned! ?” was my dance teacher’s reaction hinted with disapproval after I came back from a holiday. Again, this contrasts with the popularity of sun beds and tanning creams in the West! Beauty salons offer skin-whitening treatments and creams like Fair and Lovely are very popular. I don’t know if they work or not, but it’s a shame that attractiveness and even social mobility seems to be linked with skin colour. This is the message anyway which is conveyed by magazine advertisements and television commercials which invariably feature very pale-skinned models and actors. You don’t have to look further than the matrimonial ads in the Sunday paper to see the value placed on skin-colour: potential marriage partners are described as ‘very fair’, with a ‘wheatish complexion’ or ‘medium colour’. Ads for Fair and Lovely used to run on television but this soon stopped when there were protests against their overt ‘insulting’ and ‘racist’ messages. Here’s an example: a young woman goes to inquire about a job with her father. She’s wearing a sari and her father is dressed in traditional clothes. A very pale-skinned woman dressed in white at reception gives them a once-over and pretentiously tells them that they are a ‘modern beauty company’. As the young girl and her father turn to leave, the receptionist makes a snide comment about the girl’s appearance. When they get home, the father looks through his Ayurvedic texts for a recipe for fair skin. Fast forward to the future and his daughter is now much more fair-skinned and dressed in chic western clothes. She goes back to the same company but this time she turns heads and the same receptionist is suddenly speechless when she sees her. Suddenly she’s disembarking from an airplane to meet a crowd of television cameras. 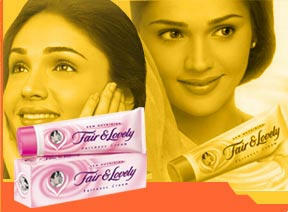 She’s an instant star thanks to Fair and Lovely Ayurvedic formula. That is sadly interesting. I just got back from Canada where my Dad said just that to me. You are looking really pale (i was sitting next to my incredibly tanned sister who had just got back from Florida) you really need more colour. Then when i was in China i needed some sunscreen and i couldn't find some that didn't have whitening formula in it. It was ridiculous as it put this film of white on my face. On a sad note, my bike (your bike) got stolen yesterday :( You didn't write down any numbers on it did you? I loved it. I"m very sad.